I’ve been designing a special New Year’s greeting card for the past couple of years in addition to more traditional Christmas-y holiday greeting cards. And I’ve always created a design around the Chinese Zodiac animals. 2016 was the Year of the Monkey! New Year’s Day is the biggest holiday in Japan and I have a fond memory of celebrating it with my family from January 1st through the 3rd. There would be lots of traditional New Year’s food my mom and grandma had prepared, and we’d go to the shrines to pray for a healthful year. This is not exactly what they made… but you get the point! We’d send New Year’s greeting cards to our family and friends in December, and as long as you send it out before Christmas, they’d deliver them right in the morning of January 1st. I always looked forward to sorting through a big stack of them to see my friends’ cards and enjoyed reading their messages. Designing a Chinese zodiac animal New Year’s card has become sort of a tradition for me. And it seems to be popular with customers who want something a little different for the holidays as well. OK, so 2017 is the Year of the Rooster! Roosters have such fancy hairdo! My style is not a photorealistic one, so after I study my reference materials, I typically draw from imagination and memory. I also don’t sketch with pencils first for most of my designs because I like the un-planned wonky look better. I wanted it to be bright and fun and also wanted to work in a color palette I hadn’t chosen for my other stationery products for the season. Yellow, teal, and orange seemed like a fun color combo! I used Sakura Koi Watercolor Field Sketch set with various gouache and watercolor paints I had. I started with drawing different parts of the roosters with one color, and switched to a different color and kept adding on to them rather than completing one rooster at a time. Less cleaning of the brush that way :D, and it’s easier to see the overall balance. What’s cool about painting with gouache (it’s basically an opaque watercolor) is once they dry, you can add lines and patterns with another color and have it really stand out! Once I felt the watercolor/gouache drawing was done, I let them dry completely and added some lines with my favorite Pigma Micron pen. I like how the black line pulls everything together at the end. And then I scan my drawings and the hand-written “Happy New Year 2017” message in to Photoshop to clean up and design the layout. I love how they turned out! Aren’t they fun?? If you’re looking for a holiday greeting card that’s a little different (or something to delight a chicken aficionado in your life), try these Year of the Rooster cards 🙂 You can order yours here! Hope you enjoyed the behind the scenes peek today. I’ll see you soon! I love to eat. And I love to draw what I eat! Surprise! One of the creative business podcasts I listen to is Seanwes podcast, and he said in one of the episodes that to grow an audience, you need to curate what you share. He says if you’re an illustrator, don’t be posting a bunch of pictures of your lunch. Instead, you should be drawing it! I noticed as I made more drawings of food, I became more connected with what I ate. 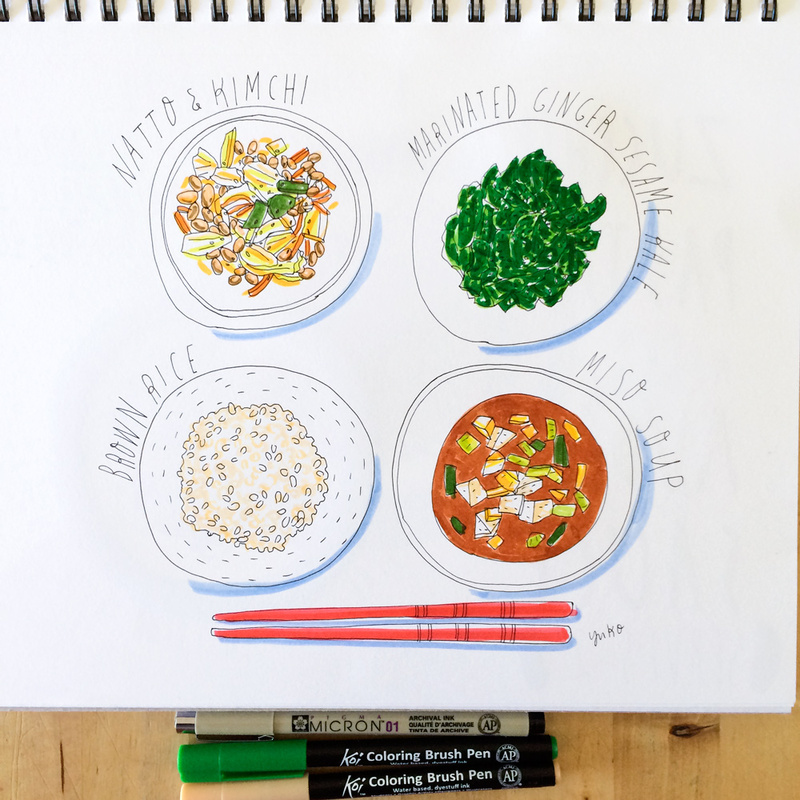 When you draw what you eat, you take the time to notice the details of what’s on your plate. The ingredients, steps you took to prepare them, the texture, the aroma, the portion of your meal, and of course, the happiness you feel on your tastebuds. 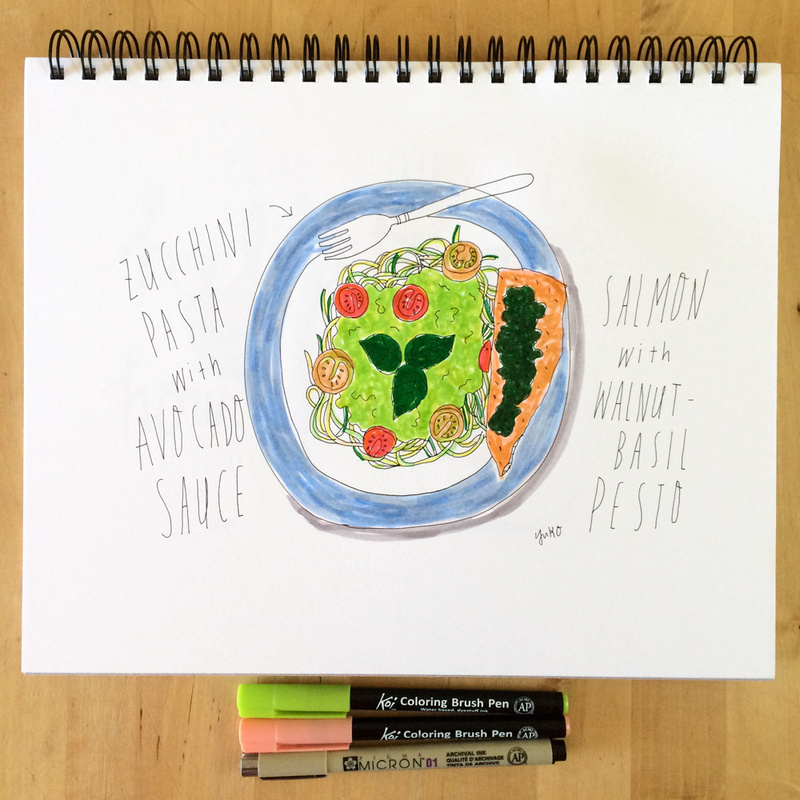 On top of that, food journaling automatically gives you something to draw! No more staring at the blank page when you’re feeling un-creative 😀 You do eat something every day, don’t you? 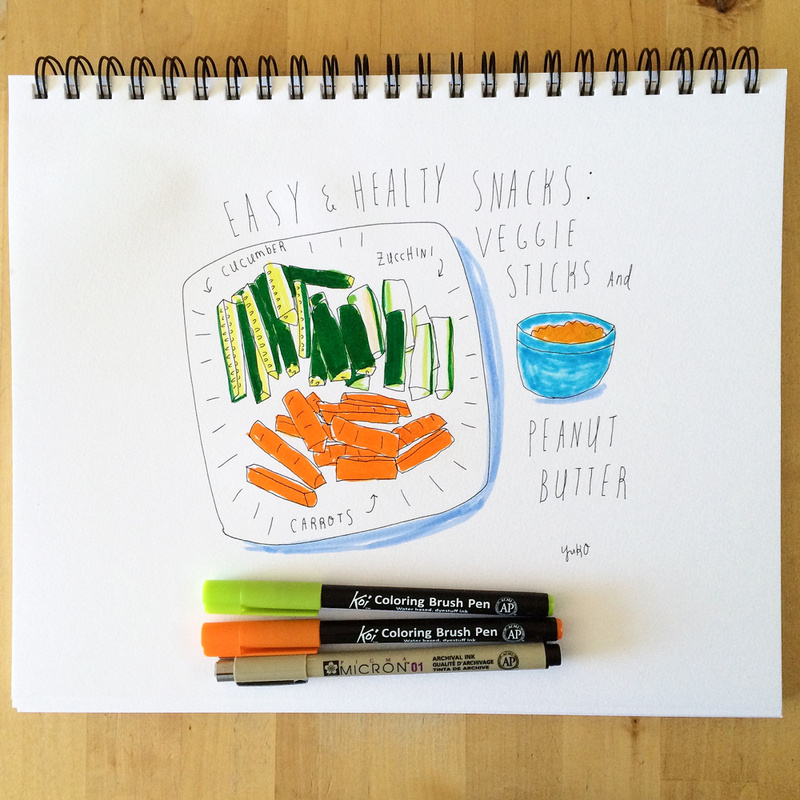 Veggie sticks and peanut butter. A simple and satisfying snack idea! Zucchini pasta with creamy avocado sauce and salmon with vegan walnut pesto. What a refreshing and tasty lunch! I have these phases where all I want to eat is Japanese food. All. the. time. Here is one simple meal I enjoyed the other day. Oh, this Avocado Chocolate Pudding is so decadent and amazing…!! My dairy-loving husband approves, too. 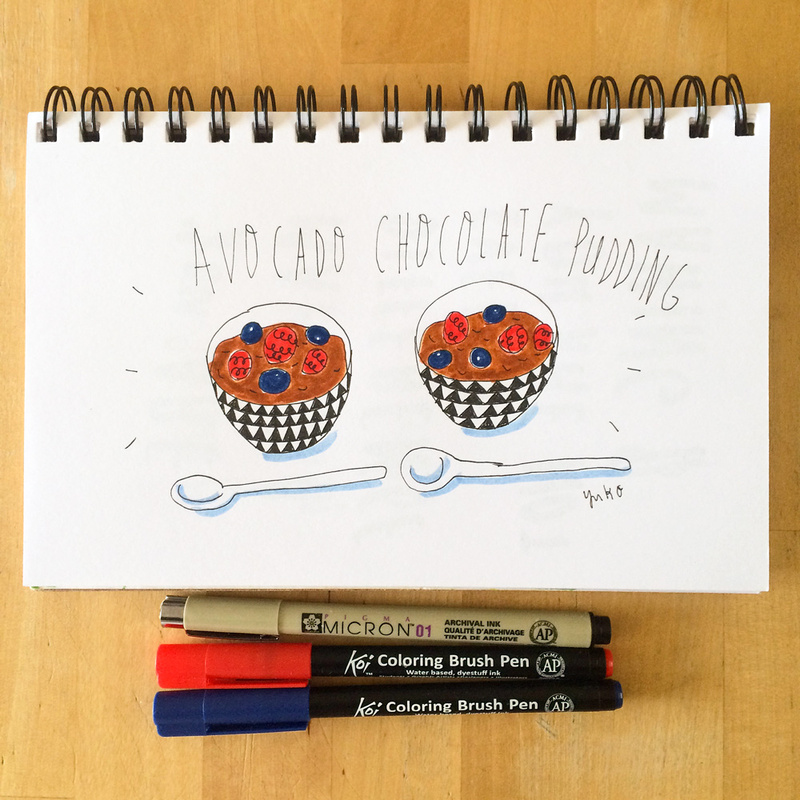 Oh man, these drawings are making me hungry… 😀 I better go feed myself now! Do you want to learn how to create your own food journal? I created a tutorial for Sakura of America and you can watch it on their YouTube channel here. I just took my mini sabbatical week off during the first week of November, and it was not easy. I’ve been taking my sabbatical week off since last October, and since it’s a regular thing, I put it on my calendar in advance. And it helps me to not schedule any deadlines or client work during that time. My mini sabbaticals force me to be more productive during my “on” weeks. Since you are taking a week off every 7 weeks (so 6 weeks on, 1 week off) you’re forced to get 7-weeks worth of work done in 6 weeks. I remember being super productive right before I left for a vacation at my old day job, and it’s a very similar feeling. For this sabbatical, even though I knew it was coming, I didn’t plan well enough in advance so everything was behind. First of all, I had to prepare for my winter holiday stationery collection release that was scheduled for November 1st. I was already behind getting everything ready for it due to planned and unplanned events this summer/fall – I swore last year I was going to start getting the holiday collection ready earlier in the summer – well, now I’m telling myself I need to start planning for next year’s collection, like, NOW. Sigh. I seem to need a reminder for the lesson #1 above, “Everything takes way longer than you think.” over and over….and over. Note to self: Always expect things will take longer. Things will go wrong. Schedule buffer!!! On top of that, my really good friend from Japan was visiting last week. So I had to juggle my collection launch timeline and hanging out with her for several days. Eeeek! Although I had to bow out of some of the social engagements so I could finish work, we did manage to do some fun things together, like visiting the Seattle Art Museum to check out their Yves Saint Laurent exhibit (it was exquisite! ), visiting my American parents on Camano Island, seeing our mutual friends, and taking a day trip to Portland. And, I taught my block printing class on the last day of my sabbatical. Look at their gorgeous work!! My sabbatical was not the most relaxing or rejuvenating, and I’m definitely feeling a little burned-out. 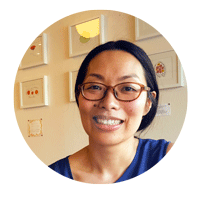 Holiday time is not the most relaxing fun time for a small creative business owner (or anyone? :D), and I really need to be more vigilant about self-care. I need to listen to my body and be compassionate with myself. Giving myself permission to slow down or change my plans, especially during my hustle time, is still one of the hardest things!! Unfortunately, you can’t just batch your self-care all at once during your time off every 7 weeks. Taking care of yourself in small doses every day really makes a difference! And, incorporating your small self-care habits into your daily routine is the key to success 🙂 Once you build a habit, it just becomes something you do, like brushing your teeth or washing your face! My 2016 Winter Holiday Collection is HERE! I’m SO excited to tell you my 2016 winter holiday stationery collection is now available on my shop!! Let me give you a quick refresher on what’s in the collection! You ready? 1. 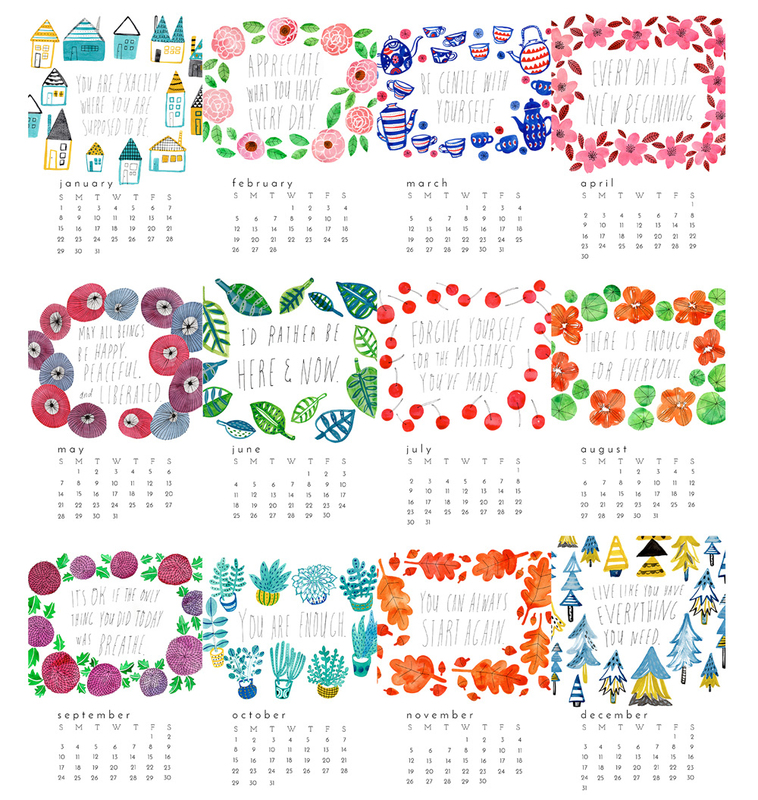 2017 Mindfulness Wall Calendar is beautifully illustrated with watercolor, gouache, and pen, and every month you will get my handwritten positive message to inspire mindfulness and gratitude. 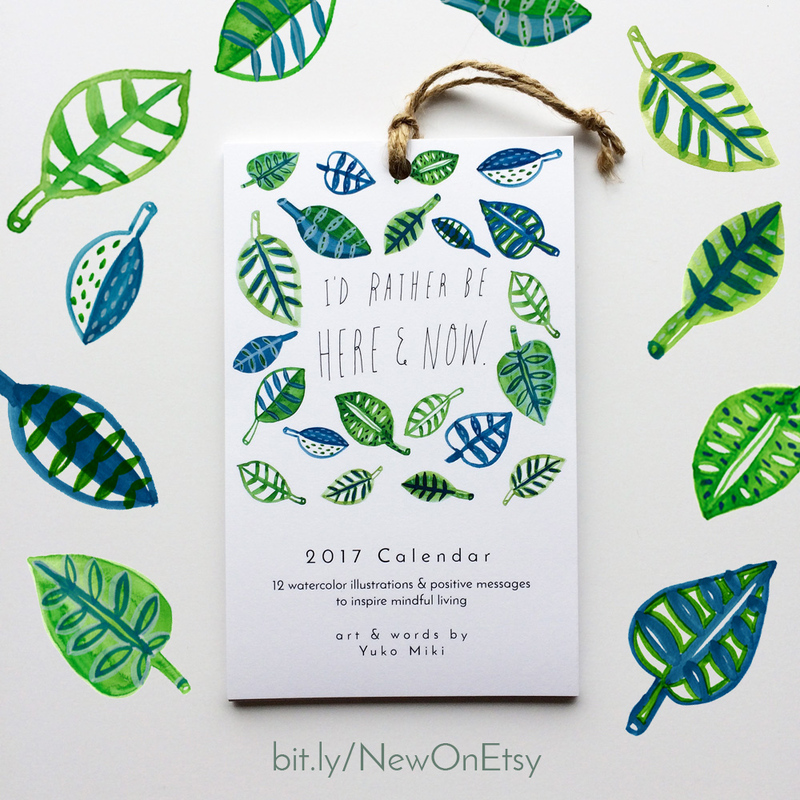 It’s 5″x8″ and fits perfectly above your desk where you will get the gentle reminder to pause and breathe every day. 2. Who wouldn’t love getting a handwritten note? Send these Peaceful Homes Holiday Greeting Cards to share your holiday wishes. They come in 3 colorways: traditional green & red, cool teal & yellow, and pink & blue if you’re looking for something a little non-traditional and fun. 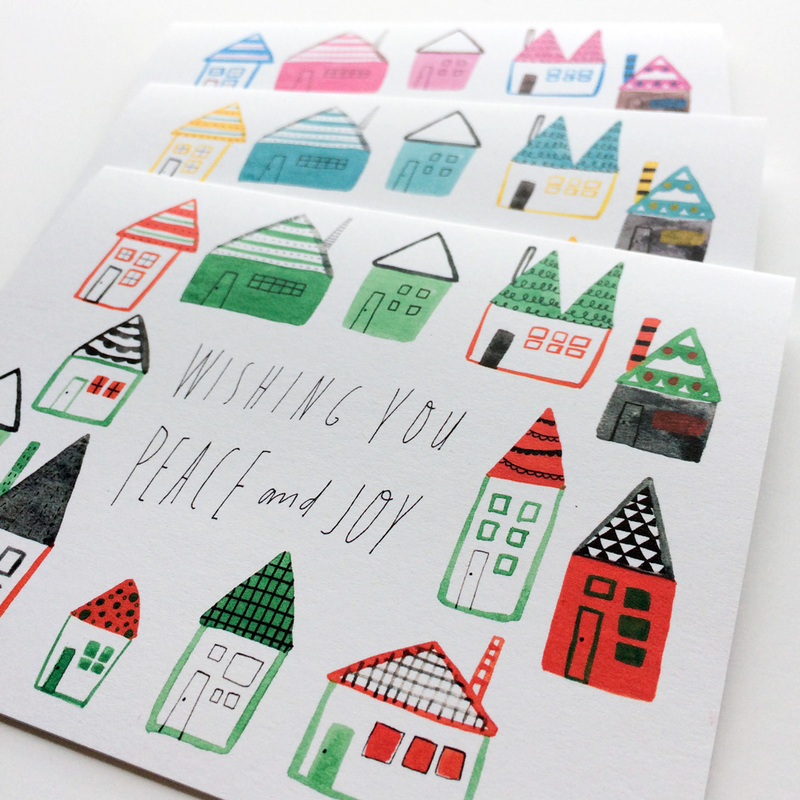 The simple illustrated designs of these holiday cards will bring peace and calmness during the busiest time of the year! 3. And my new kraft notebooks also come in 3 designs: Green Leaf, Circle Flowers, and Succulent Plants. 4. Last but not least… In case you just WANT THEM ALL (I know, it’s so hard to choose! ), I’ve created a holiday gift bundle for you! 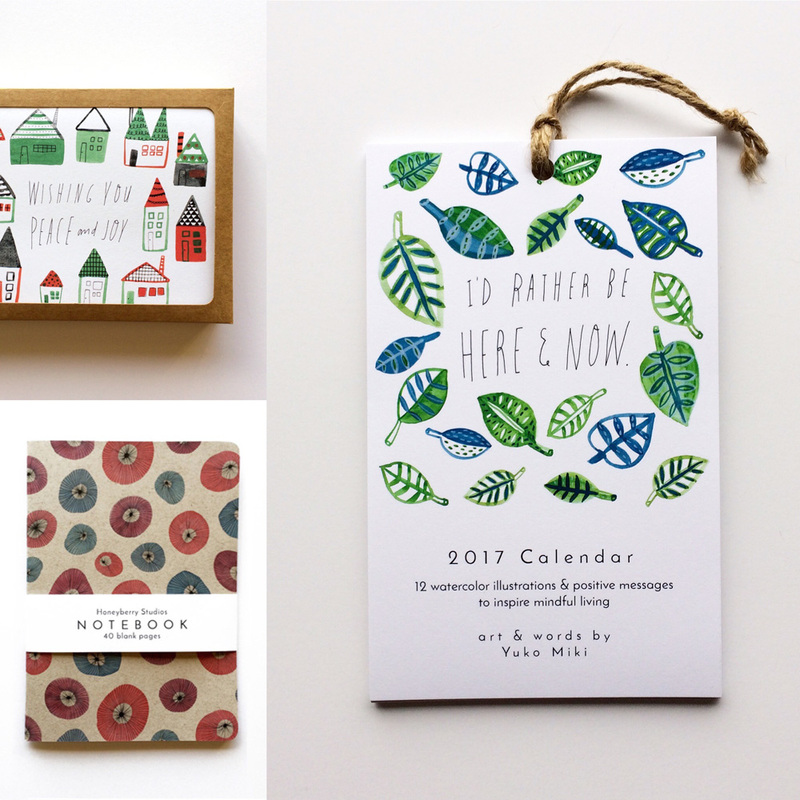 It includes the 2017 calendar, a box card set (assorted colors), and a set of 3 notebooks. It’s a sampler of the new holiday collection, if you will. And by ordering the bundle, you save $10! You’ll definitely get the most value out of my new collection when you order the bundle. Oh là là! Heck, you’ve been working so hard this year, you deserve a little treat, don’t you think? In case you missed the link, you can view more photos and shop the new collection here.